I admit Peter Davison is not my favourite Doctor but I do really like Nyssa and Tegan. This was a really interesting adventure. Normally the audios don't work quite so well for fake medieval/technology type settings but I really liked this one. The fantasy element and the robots actually worked really well together. I think it was definitely helped by having Honor Blackman and David Warner as guest stars. They both did a superb job. This is one that I'm definitely going to listen to again. The Doctor, Tegan and Nyssa get a request for help. The Emperor's consort thinks something is going on and wants to stop it. This is a lost story, I think it may have been too confusing for a TV story. There's some nice character bits, especially for Tegan and the guest cast is really good. There's some nice twists that keeps you listening. A good audio. This is one I'll listen to again, maybe right away. 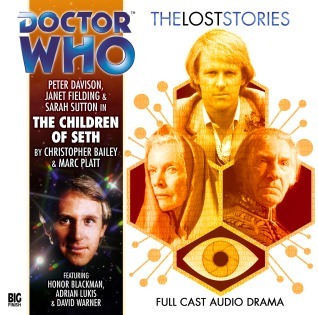 Reminiscent of such classic tales as Caves of Androzani and Robots of Death, this story fits in well with the "Snakedance" era of the show and would have made for good television. Any idea why it wasn't made? A clever story but, quite honestly, boring as hell. It's a pretty good example of many of the things I don't like about the 5th Doctor era. A lot of maths as magic business and technobabble with some half assed psychedelic business. The end was kinda neat but my attention drifted a lot on this. The Doctor, Tegan and Nyssa pick up a signal and decide to investigate a cryptic message. When they land they are caught in a war between a fictional figure and a robotic maker who wants to rule.